Welcome to Celebrity Blogger Week! Over the next week (or so), we’ll be highlighting the amazing people who will make the magic of Lent Madness 2018 happen. Our slate of 32 saints doesn’t just come to life on its own (excluding the whole Resurrection thing). No, it takes our gifted Celebrity Bloggers to tell their stories in engaging ways and we’re grateful to all of them for being part of the vaunted Lent Madness team. If we’re being honest, it will take more than just one week to highlight our 11 celebrity bloggers and a few others like our Bracket Czar and Celebrity Chef. But Celebrity Blogger Fortnight just doesn’t have the same ring. So enjoy reading about these fantastic folks. We share their basic bios and then ask them to answer three carefully hand-crafted questions. We’ve also asked them to provide a photo of them doing something they’re passionate about (besides writing saintly bios). In case you were wondering about the lineup presented, we run these features in the order in which they are received. So Anna Fitch Courie is number one because she submitted her responses to the Supreme Executive Committee first. Also, she’s Number One because she is the defending Golden Halo Champion, having shepherded Florence Nightingale to the highest of honors in 2017. But that’s just mere coincidence. 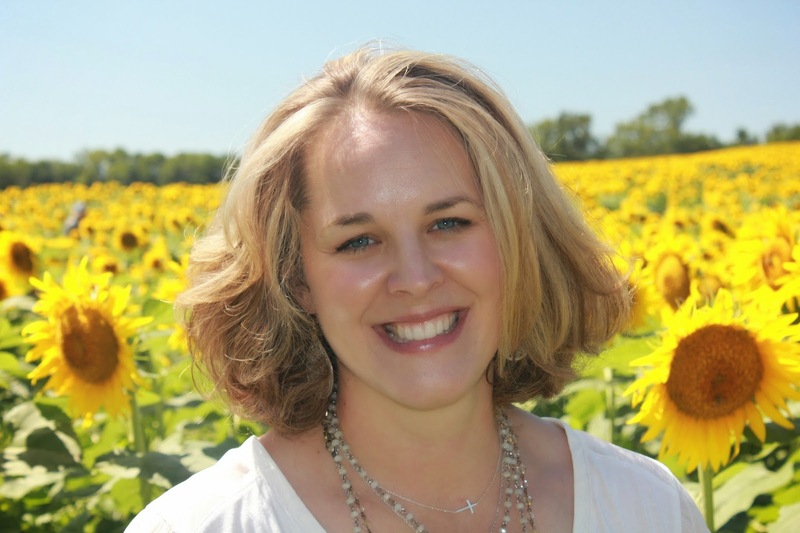 Anna Fitch Courie Anna Fitch Courie is an army wife, nurse, layperson, and the author of “Christ Walk: A 40 Day Spiritual Fitness Program” (Church Publishing, Inc., 2015); “Christ Walk Kids” (Church Publishing, 2016); “Sally the Comet” (CreateSpace, 2015); “Sally and the Constellations” (CreateSpace, 2017), and “The Adventures of Cancer Girl and God” (Church Publishing, 2018). 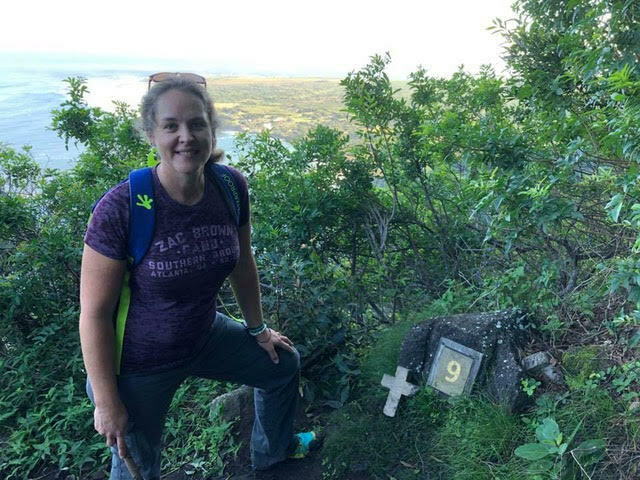 Anna finds her calling where health and spirituality intersect. 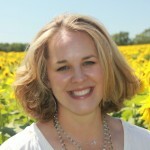 Anna is a registered nurse by training and has been working in the health care field for the past twenty years. More recently, she has been a consultant on building community coalitions on health. Anna is a graduate of Clemson University, the University of Wyoming, and Education for Ministry at Sewanee: the University of the South. She is currently enrolled at Ohio State University in the Doctoral in Nursing Practice program. In her spare time, she fights cancer, consults in public health, and runs Christ Walk, retreats, writes books, and blogs for “50 Days of Fabulous” and “Lent Madness.” In her dream world, she hikes the El Camino and Mount Rainier, sails, travels, cooks, reads, and attends every Clemson football game each season. Home is wherever the Army (and God) sends her. You can find her on her blog at Christ Walk; on Facebook; on Twitter @christwalk1; and on Instagram @christwalk1. After a recent visit to Kalaupapa, Moloka’i to see the Leper (Hanson’s disease) colony, I am currently enamored of St. Damien. St. Damien’s bishop had offered to relocate Fr. Damien from Kalaupapa so that he would not be afflicted with leprosy. In response, Fr. Damien replied (paraphrased) that he had no fear of contracting the disease and even if he did that his faith was in God that he would be made whole at his death through the gift of the resurrection. There is something incredibly profound about staring disease in the face and having faith in God regardless. Fr. Damien knew there was more than this life and he was putting his eggs in God’s basket. Anyone who knows my story knows this means a lot to me. I believe fiercely that no matter what, all will be made well. As for food, is there any other choice but pizza? Pizza is proof that God loves us. 2. What hymn would you pay money never to hear again? And which hymn are you convinced is on the play list in heaven? Believe it or not, I’m not much of a hymn person. I honestly prefer the contemplative silence of 8 o’clock church. Being a go, go, go, busy, busy, busy person, there is something about the silence of 8 am that helps to center me on God. So I can do without music (*ducks and runs for cover from all the choir members in the Lent Madness faithful*). I’ll blame it on becoming deaf at a young age and wearing hearing aids. With that said, I LOVE “Praise to the Lord, the Almighty” and will often pull variations up on YouTube to listen when I’m feeling angsty. I am also a huge fan of “I am the Resurrection” which my husband gives me grief about it because he thinks it is too folksy for church. 3. You’re busy during Lent. Why do you make time for the Saintly Smackdown? What do you get out of it personally? I’m always busy. Everyone is busy. If you don’t make time for the important things like your spiritual practices then what do we make time for? Spiritual discipline requires putting aside time towards spiritual practices. This can come in many ways, and the Saintly Smackdown is a fun and different way to approach your spiritual studies. It’s a process of prioritizing what’s important at any given time and I’d like to think that it adds to my understanding of how other people have fared on their spiritual journeys and continued to Trust in God despite their hardships. It’s a lesson we struggle with today. Plus, whenever I’m paired up against Laurie Brock, it’s like Clemson and Alabama are playing in the National Championship all over again and I like to see who has bragging rights for their saints. In all seriousness, I’m surrounded by incredibly talented writers and devoted Christians. They make me a better person as I’ve learned about them and their Saints and what they’ve taught me about Trust in God. 10 Comments to "Celebrity Blogger Week: Anna Fitch Courie"
You’re definitely my hero of the day. I love Father Damien. I used to live in Hawaii, and for a while, I lived on Molokai, being one of the managers of the Mule Ride down to Kalaupapa. I love that community and Father Damien. Plus, your comments about finding time and space for spiritual practices resonates soundly with me. As an ordained United Methodist minister, I have to ensure that my own spiritual life is nurtured so that I may nuture others. That’s one of the reasons I love Lent Madness! Thank you for your post. I can’t believe it’s time for LENT MADNESS so soon. Time, the 2017 year, my unread magazines, and everything else…all piled up and jumbled. Well, I’ll just have to prioritize and fit in LM and the Padres and esteemed bloggers, one and all. We’re off and running ! It took you several tries, but I am glad that you gave finally made it to the correct educational institution -THE Ohio State University. O-H, Anna ! So glad to have an RN as a celebrity blogger! As an RN I get to work with and care for everyday saints every day. If folks think some of the nominated saints may be a bit off or out there they have to check out their local community hospital.